Landless quake victims: Why are we deprived of state aid? Landless quake victims of Thakre village participate in a group discussion organized to figure out ways for approaching the government for quake victim grant in this recent picture. DHADING, Feb 2: Gothelal BK of Nalang village of Dhading district feels helpless as he watches his villagers building houses at war footing. Seeing them, this homeless man does not know how to make one for his family. The government did not provide him the earthquake assistance grant distributed to quake victims because he did not have land registered in his name. “All the villagers will soon move into their new houses. But my family is doomed to live in tents. The government did not provide us the grant that it distributed to villagers. Neither did it provide us land,” BK shared with a feeling of being helpless against what he thinks as ‘state’s injustice’ to people like him. BK’s family has been living in a hut covered with plastic sheets after the earthquake rendered them homeless in April 2015. Just like other quake victims, he also waited for nearly two years to start building new home. But his hopes were dashed. Everyday when he sees his villagers’ houses coming into shape, he feels the pang. “I am a Nepali. I am a victim of the earthquake. And I am a landless. That makes me poorer than those who have land. So, why am I deprived of the state grants? Don’t you think people like me should be the first to receive state assistance?” BK said adding that his family never owned a piece of land. There are dozens of others like BK who are simply heartbroken and feel betrayed every day while other villagers construct their houses. Even though they have been living in the village since their grandparents’ time, most of the Dalit families do not have registered land. “We have been living here and using the farm as our own since our ancestors’ time. But we never needed to have a certificate to claim it,” BK stated. According to another landless earthquake victim of the village, Buddhilal BK, measurement of his house plot was done way back in 1977. But it was not registered under his name. “If I was bit clever, I would have procured the certificate then. Government officials measured my house plot but I was not efficient enough to have the paper work done then. Now I wish I would have done it,” he lamented. Buddhilal stated that lack of awareness among Dalit people and other marginalized groups led to their sorry situation. “It was never a crime to have houses on unregistered land. At least I am not aware of such law,” he said. “Aren’t we the citizen of this country? Though we have also been equally victimized by the earthquake, why is the government not providing us grant for house construction?,” Buddhilal asked sharing his unwillingness to accept state’s decision of providing grants only to quake victims who have land ownership certificate. A lot of quake victims in Nalang village, too are in trouble due to lack of registered land. They say that their forefathers in fact purchased land from earlier owners, but back then land registration certificates were not issued. “We didn’t receive the land for free. Our ancestors purchased it. Some of our lands were purchased in the days of grand parents,” said Manamaya Ghale. “But, we do not have land certificate. If it was not ours, we would not have been living here,” she added. Ghale stressed that the government should look at the matter fairly and give justice to quake victims like her. Instead of further victimizing the earthquake victims, they need support to get back to normal life, she said. As per the data of Natural Disaster Rescue Committee, 181 families in the district do not have registered land. These landless quake victims have registered their names and status to the committee along with an appeal for justice. Even though the National Reconstruction Authority (NRA) had issued public notice informing its guidelines for claiming the grant, few earthquake victims report that they are aware of it. In its notice, the NRA had asked people, who were yet to register their land. However, landless victims of Dhading state that they were not aware of it. Shalikram Acharya, chief officer at the district’s land revenue informed that only one person had appeared with the request for registering land. However, VDC secretaries said that even they themselves did not know about the guidelines let alone the locals. 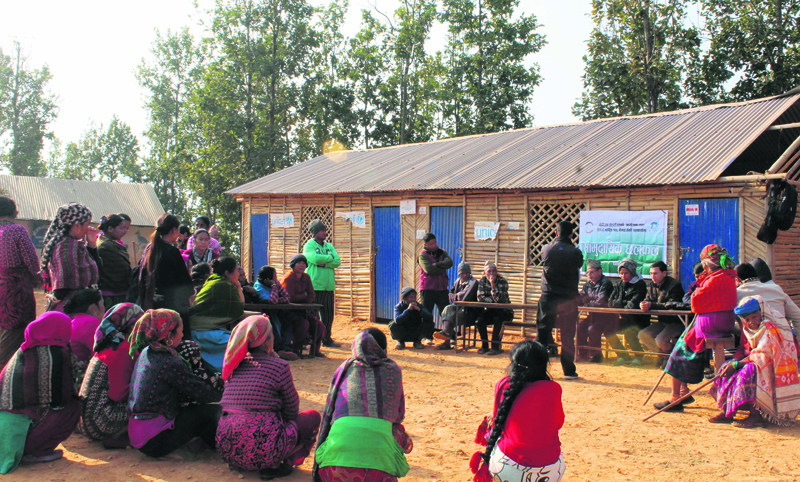 Surya Prasad Devkota, secretary of Nalang VDC, informed that there are around 100 quake hit families in the VDC who don’t have land ownership certificate. “No, we have never been notified to have the landless people register their land. Or else, we would have done it,” he said. “We are going to take this matter to the reconstruction authority. This won’t be fair with the victims,” he informed adding that the deadline for registering the land was already over.